Bharat Book Bureau Provides the Trending Market Research Report on “Global Digital Pathology Market Research Report, by Type (Human Pathology, Animal Pathology), Product (Hardware, Software), Application (Disease Diagnosis, Mhealth, Drug Discovery) and End-Users (Hospitals, Diagnostic Centers) - Global Forecast Till 2023” under Life Sciences category. The report offers a collection of superior market research, market analysis, competitive intelligence and industry reports. Digital Pathology involves converting glass slides into digital slides that can be observed, managed, shared and examined on a computer monitor. With the influx of whole-slide imaging, the framework of digital pathology saw huge growth and is currently regarded as one of the most promising avenues of diagnostic medicine. The global market for digital pathology is estimated to show a growth owing to a dearth of pathologists in the presence of cumulative demand for healthcare services, benefits associated with the use of digital pathology, increasing adoption of Electronic Health Records (EHR), and cost saving associated with the application of digital pathology. However, factors such as the high cost of implementation and stringent FDA policies are expected to restrict the market growth over the forecast period. The global digital pathology market is expected to reach a market value of USD 8,305.6 million by 2023 from USD 3,937 million in 2017 and is expected to register a CAGR of 13.04% during the forecast period from 2018 to 2023. In 2017, the Americas held the highest share of the market at 45.3%, followed by Europe and Asia-Pacific with shares of 26.2% and 21.3%, respectively. The increasing applications of digital pathology are expected to increase the growth of the market during the forecast period. The global digital pathology market is segmented into type, product, application, end user, and region. The global digital pathology market, by type, is segmented into human pathology and animal pathology. The global digital pathology market, by product, is segmented into hardware, software, and storage. The global digital pathology market, by application, is segmented into disease diagnosis, mhealth, drug discovery, telemedicine, and others. By end user, the global digital pathology market is segmented into hospitals and clinics, research centers and academic institutes, diagnostic centers, and others. 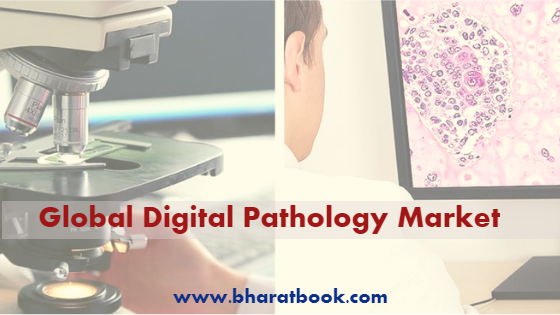 The global digital pathology market is expected to have a value of USD 8,305.6million by 2023 from USD 3,937 million in 2017 and is expected to register a CAGR of 13.04% during the forecast period from 2018 to 2023. Koninklijke Philips N.V., Olympus Corporation of the Americas, Danaher Corporation (Leica Biosystems GmbH), Inspirata, 3DHISTECH Ltd., Definiens, Huron Digital Pathology Inc, F. Hoffmann-La Roche Ltd, micro dimensions GmbH, and Mikroscan Technologies, Inc.